Since 16th Century, when Agra was made the capital of India by, the Mughals and constructed all the spectacular monuments, that are listed among world heritage sites, <Mughal empire left indelible imprints on Agra’s taste as well. Similar to the love of food in Delhi and rest of North India, Agra also has plenty of yummy dishes. A few trademarks are creamy, boldly flavored curries; dried fruits and nuts; roasted meats, lots of ground and whole spices, It’s a rich cuisine fit for a king. To enjoy the best Mughlai Food, you can go to NaikiMandi, TajMahal Restaurants, Indiana and MG road. A famous breakfast dish among Agra-wasis, this typical breakfast is served at street stands, corner points and on redis. This mouthwatering dish consists of two parts, one of which is spicy and the other one is sweet. Bedhai part of it is a fried, round, puffy bread typically served with a bowl full of spicy green sabzi made from of potato and curd. Jalebi, as most of you must have tried is sweet, a sticky dessert made of fermented batter. Fresh Jalebis and Kachoris are so famous and loved that the street corners are filled with people in the morning time. GMB and Shree Ji sweets on Fatehabad Road are famous corners with Bedhai&Kachori being its specialty. As in Delhi, the chaats are too much spicy but yummy. In Agra also, chaats are very popular; especially dahi-bhaal, raj kachori, samosa and golgappas are famous. But when talking about Agra we will focus mainly of the bhallas, as Agra bhallas are a bit different than what you have in Delhi.The bhallas are made big and crispier in Agra. To enjoy chat you can go to Chat waliGali in Sadar Bazar, Agra. Trademark of Mughlai (and therefore North Indian) cuisine, paratha, or parantha, is similar to chapatti but it is pan-fried and stuffed with various ingredients, mostly vegetarian. You can enjoy the parathas with Paneer or some kind of chutney. Dahi(Curd) remains a constant with parathas. A famous paratha point is on Old Delhi Agra Highway called as RambabuParathe Wale. Petha, Petha everywhere! The moment you step in Agra, you will find pethas around you. Petha is a sweet dish and is available in many flavours like plain (white); Kesar(saffron); with nuts; in colorful shades of pineapple, strawberry, mango that too in different shape.Petha is believed to have medicinal traits and is considered good and beneficial for blood pressure, hydration, brain growth, and more. The best Pethas can be found inPanchhiPetha and Baluganj. PS: To avoid the hassle of rickshaw choose simple, safe and easy travel with AHATaxis. 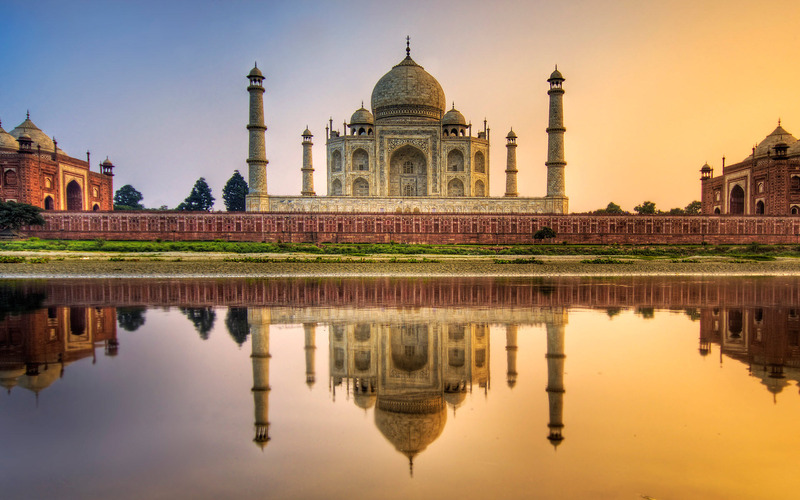 Book your Delhi to Agra trip now! Great post! Thanks for sharing! . I love all the food items in your list. Do you have taxi service from Moradabad to Agra, If yes what is the fare one way?